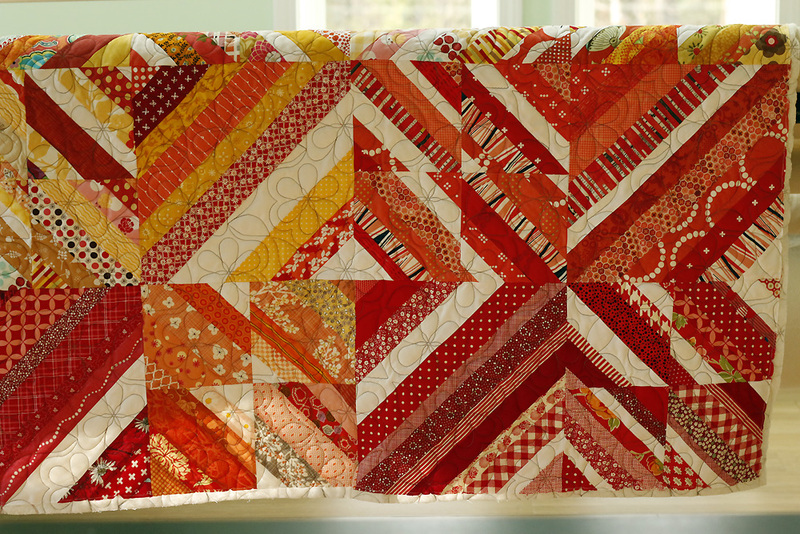 What's it like to learn to longarm quilt? It's a question I know you have, but I think my answer is a little unhelpful. Most likely you would rent or purchase a hand-guided longarm sewing machine. They're designed to allow you to free motion quilt without having to wrangle the quilt through a sewing machine. I'd still like to try that! What we're doing at Stitched in Color is different. Brandon and I have invested in a top-end longarm quilting machine - the computer-guided Statler Gammill. It's large and heavy - not designed for hand-guided comfort. Our intention is to do 100% computerized quilting. Why? This allows Brandon to run the machine and allows us to offer a wide variety of quilting designs right from the start. We're prepared to finish and return quilts promptly, thanks to the speed of computerized mode. So, is there a learning curve? Totally! This week we finished our initial test quilts. We were lucky to have a wide variety of quilts to work with, and they taught us lots of things. Of course there were the basics, like how to load the quilt on the machine and baste it. We do more basting than some folks, but I feel good about knowing things are even and straight all the way through before starting the quilting. But beyond the basics, we learned how to deal with difficult quilts. Because quilts aren't perfect! We've worked on quilts with pockets of fullness, bias edges and bulky seams. One quilt from a local friend was intentionally given to us as a challenge. It was a postage stamp quilt where many of the squares had been cut the wrong size! As a result, the quilt was FAR from square and some areas were noticeably fuller than others. Yikes! We quilted that one into submission and it's happily being used on a little girl's bed right this moment. I love that. Do you like that? It's fantastic! Guess, what? It's our our very first customer quilt!! And, happily, it arrived nicely flat and square - an easy one for our first paid job. The customer and I agreed on Baptist fan for the quilting pattern. Doesn't it look fantastic in all that negative space? I'm going to put a Baptist fan on one of my quilts someday! I hope you're enjoying following along with our quilting services journey. I'll be writing next week about batting and/or thread. Currently we include Warm & Natural or Hobbs 80/20 batting with purchase, and we're testing a variety of high quality threads (more info here). We're accepting orders now for quilting the week of January 22nd. So far, we're working ahead of schedule! Here are the details on our process, if you're a details person. Let me know if you have questions or suggestions!